The Aesthetic Rejuvenation Center offers the award-winning Alma Soprano XL Near-Infrared Laser Hair Removal System. The Soprano XL platform represents a new era in laser hair removal technology and treatment methods; allowing to treat the widest range of patients and hair types quickly and painlessly, all year round. Getting rid of unwanted hair is an age-old issue, with long-term hair removal being particularly challenging. The SHR hair removal method uses groundbreaking technology to offer a simple, one-stop solution for truly effective hair removal. 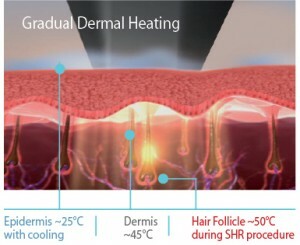 SHR’s unique gradual heating method effectively damages the hair follicles while avoiding injury to the surrounding skin. Advanced Soprano XL technology cools the skin during treatment for longer periods of time, minimizing the risk of burns while maintaining heat within the dermis where hair follicles are treated. The result is a cutting-edge hair removal solution that delivers superior results for all skin types- including dark skin.